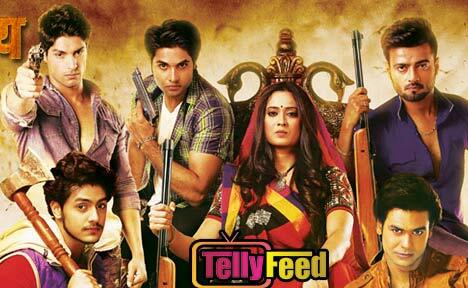 Begusarai taken a post leap will be showing Bindiya as Maa Thakurain of the house. Along with Garv(priyom&bindiya son), Shakti(Lakhan&poonam son), Amar, Samar and Adarsh(Maya&Mitilesh sons). The 5 sons of the Thakur family are submissive to their Thakurain Bindiya, they follow in her footsteps and legacies. A lady is forbidden to them as per Bindiya’s orders hence, they show no mercy nor move close to any woman. But, their rule is broken when a new female lead, Ananya enters the show. Ananya’s entry reveals hidden secrets and turns the impossible into possible! However, Zee World channel might not delve into this episodes and end the serial before the leap, which is why we bring you the season finale teasers of the show! 1) Bindiya unleashes her anger on Ananya and set the boys against her. Shakti follows his mother’s orders and points a gun at Ananya’s forehead. 2) Bindiya gets arrested and this angers her sons including Shakti. Shakti barges into Ananya’s home and does something scary to her. 3) Ananya can’t believe Shakti is trying to save her but he manages to prove her otherwise. 4) The lawyer states that Ananya’s statement can lead Bindiya to jail. What will Garv do to save his mother now? 5) Shakti takes Ananya to where Lakhan and Poonam died and confesses that he is in love with her. 6) Ananya’s hears Bindiya’s conversation to kill Bhavna and decides to save her. Adarsh outsmarts Shakti and Garv as he escapes with Bhavna from the hideout. 7) Bindiya starts to realise Shakti’s soft spot for Ananya. Bhavna is on the run from Bindiya but Garv and Shakti are after her. 8) Ananya breaks a news about Bhavna’s condition which leaves everyone stunned. Something tragic happens to Soni. 9) Bindiya finally stops being a Thakurain and accepts her sons with love and care. Shakti finds Ananya and they unite once again.